How convincing can practical special effects be in real life? A trio of black men wore masks purchased from a special effects company while committing a robbery in order to make witnesses believe they were white—and it actually worked. 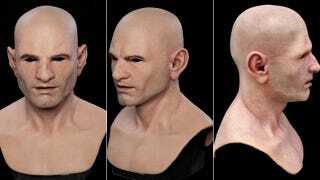 The AP and the New York Post both report that three men allegedly invested $3000 in "Mac the Guy" masks from Composite Effects, a silicone masks manufacturer that has created effects for movies, including The Wolverine. They donned the masks, dressed up as police officers, and robbed a check-cashing outlet to the tune of $200,000. When questioned, the check-cashing staffers reported that the robbers were white, but police traced the the crime to the accused through other means, including a particularly effusive email that one of the accused sent to Composite Effects praising the realism of the masks. The three were found guilty this week. They made their mistakes in the execution of the crime, but for a little while, their special effect did, in fact, work.